No need to Break the Bank!! Eating well, whole foods, and refined sugar free doesn't have to cost you (too much)! Choose what works for YOUR FAMILY and live guilt free! Just because I can do it - or someone else can - does not mean that every tip and idea will be worth your time! These are all tips that I use - I do not always do ALL of these things! I do what works on any given day with the workload and stressors I have! So relax - take a deep breath - do what you can - and remember - it is a process! It is true that good food should be worth something. We should be willing to pay for what we get (and pay the farmer for his time!) but there are ways to save some money. Vegetable Co Ops - we live in the north where this isn't feasible but where possible, find a farmer! We do buy potatoes and onions locally in season. In your location there may be other options! Food Co Ops - in large centers there are co ops that buy in large quantities and divide the expenses! Again - not in our location! Fruit Share: In Winnipeg there is a fruit share organization that for a small fee matches home gardens / fruit trees with volunteer pickers. 1/3 to the garden owner 1/3 to the pickers and 1/3 to the food bank! Everyone wins! It costs $10 per year and you receive emails about planned picks - you choose which picks to register for. Watch the fall sales! You often see sales for potatoes, beets, onions etc for less than you can garden them for! I bought 10 lb bags of beets for $3 this year! Get a freezer (which is easier than canning!) or learn to can! Do it Yourself! You CAN make lots of things that are expensive to buy! Don't Waste it! Use everything! Make broth from those bones, find a way to keep your veggies longer - lots of ideas on this page! Use Natural Cleaning Products - this will save you LOTS of money - and its good for the environment and your family! See the Household Products page! 2. Strip all the leaves and put them onto a microwave safe plate. Microwave them 1 min. at a time (and when they start to dry at 30 sec. intervals) mixing them and crushing them as you can. When they are all dry and crumbled let the cool and put them in a spice jar. 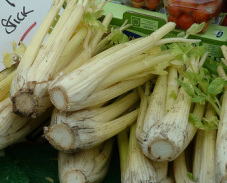 These are great in soups, stews, spaghetti sauce or in spice mixes! 3. Use a large ziplock bag - wash the stems if dirty and put the stalks in a ziplock with a couple Tbsp water. Seal and refrigerate. Your celery will last a LONG time like this (weeks!) You may have to trim the ends before use. 4. If they get soft and flexible - you can rehydrate them! Just cut off the ends and put them in a bowl with water in the refrigerator. In a few hours they'll be as good as new! You've bought lots from the farmer - now what? b/ prepare a bunch now... make oven fries, twice baked potatoes... and freeze (recipes online - just google! 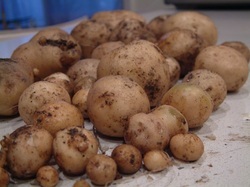 c/ Refrigerate - if you have room, refrigerated potatoes will last until spring! It may be worth buying an old refrigerator to have cheaper, and pesticide free potatoes! And you know those farm onions that come with all the greens attached? Here's what to do with them all! b/ Use what you need fresh and dry the rest! You can just bunch them and hang them and they'll dry - or chop them up and use a dehydrator. I use green onions dried in my ranch spice mix all the time! 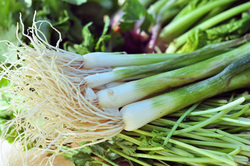 c/ you can also freeze green onions - chop them up and throw them in a zipper bag! Maybe they're a good price at the store or maybe you have lots from a farmer in season. 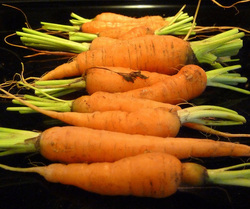 You can also can carrots if you're handy in the kitchen, or clean, blanch and freeze them. Personally I've never had a lot of luck with the texture of either. I guess we're just fussy! What I sometimes do is grate (or finely chop in the blender!) a bunch and freeze them in large zipper bags in a thin layer (or pre-measured smaller bags) and freeze the carrot for baking. I'm a lot quicker to make carrot muffins or just throw it into meatloaf if I don't have to grate it! I take a kg or so and roast it. Then pop the individual cloves out and store them in a zipper bag in the freezer. The rest I peel (yes it takes a while but you do get fast at it!) and mince in my Ninja blender - you could use a food processor. Then I freeze it in large zipper bags in a thin layer so I can break off a piece. I think we eat more garlic this way because I don't peel it every time and I don't have garlic growing on my counter etiher! 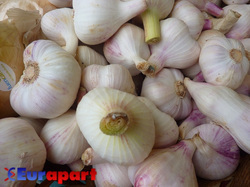 Garlic can also be pickled, or fermented, but I've never tried! DRIED HERBS - VEGETABLES - Often you see green onions, parsley and dill on sale very cheaply - they are all super easy to dry! Hang them up and wait! I also dry celery leaves in the microwave! No dehydrator required! If you can grow these things in your garden you can dry them and freeze the dried veggies and they'll last for years - no need to grow them every year! SPICE MIXES: Don't buy those expensive mixes - or dip packages! You can make your own mixes from the spices you normally use - and do it without sugar or nasty additives! Check my Mixes and Spices Page for Recipes! BAKING: If you're living sugar free you already know you will need to bake for yourself! Even if you're not - it is WAY less expensive, and healthier! You can prepackage granola bars etc to pull out of the freezer on your way out the door! Sometimes though, if you're looking you can find great natural granola bars etc that are nearly as little as you can make them for! NOODLES: If you are the kitchen sort of person you will find making pasta to be very inexpensive (at least compared to whole grain pasta's on the market!) and it is delicious! Pasta rollers are available used very often! Turkey Broth is dead simple. Throw the bones and organs, neck etc in to a large pot and cover with water. Add 2 tsp of water. Simmer for a few hours strain. I usually freeze it since I don't have much luck canning! It tastes better if you add a large onion and some celery and carrots. Beef Broth is just as easy but I rarely have beef bones to boil. Vegetable Broth is just as easy and can be made of discards. If you want you can have a large bag in the freezer that you just keep adding discards too (left over veggies from meals, wilted greens, carrot tops, potato peels, cauliflower leaves, celery ends.....) When its full just add water and salt and boil away! A FREEZER SOUP BAG is also a great idea. I have a friend who puts left over vegetables in a freezer bag to make soup. Not the ends and peels but little leftovers from meals. Then when the bag gets full she adds beans or meat and some stewed tomatoes and it makes a delicious soup!